There is a secret at the core of the universe. A secret that crossed the boundaries of time, journeying through the chaos of matter. A secret kept inside a locket of eternal mystery. A gem. A shell named Nautilus. Silent, incorruptible in its perfection, this precious shrine wandered through timeless spaces, cherishing the cryptic, inscrutable laws that rule the multiform evolutions of the world. In the beginning were the oceans alone, and they were shaken by the dance of the wondrous creatures dwelling in their depths. Then the tides came, mesmerized by the magnetic powers of lunar attraction. The waters withdrew and the abysses revealed waves that crystallized into rocks and mountains. The peaks opened their cavernous mouths and swallowed the Nautilus, hiding it inside the granular mass of the impenetrable bowels of the earth. Then they rose and drew draperies of stone on the remotest altitudes, concealing behind a natural canopy this unique jewel of immense worth. Dancing to the mysterious and incomprehensible rhapsody of the spheres, the mountain cracked, the rock crumbled. Then it was sand and the sand was desert and the desert was land, fertile with life. The entire world moved to the secret rhythm of the heart, invisible yet extant, beating inside everything. And so did the Nautilus, key to everything, firstly enclosed inside the hollow mountain, then buried in the scorching dunes, lastly concealed in the shady depths of the lush forest. Its spiral was an energy knot embedded in the centre of the cosmos. And finally the hand of Man found the shell. His eyes set for the first time on the concentric coils of its frame. The minds of sages and philosophers were entranced by the perfect proportions that dilated and fortified its concentric circles, in harmony with the winding spiral of time. From the colonial temples of Magna Graecia, to the secluded cloisters of medieval monasteries, to the dazzling metropolis of the third millennium. Through all time and distance, the greatest erudites sensed that the Nautilus carried within its frame the secret code that regulates the pulse of life within the universe. For centuries they investigated its shape and proportions. Its secret cannot be comprehended by the rational logic of human mind. It can only be experienced, felt with every fiber of one’s being. Only within the unfailing symmetries of the helical Nautilus, the harmonious frame reveals its secret core, the force that rules the journey of the planets: the secret vibration of the atoms and the magnetic flow of feeling that connects us with the inestimable object of our purest love. Everything in the universe bows before this law. Through our inner beings its vital fluid flows, gushes and pours into everything. The deeper our devotion, the stronger grows our empathy with the force that holds the worlds in balance and puts time in motion. Men of genius defined the secret law enclosed within the Nautilus “Divine Proportion”. They named its geometrical progression “Golden Ratio”, in homage to the purest of metals, symbol of alchemical perfection. Its force was then sublimated into Art, giving origin to immortal works. Architectures, sculptures, paintings, poems and music. Multiform expressions of that single flow that secures the balance of things and transforms distance into proximity, separation into connection, discord into harmony, generating a perfect fusion of soul and sentiment. 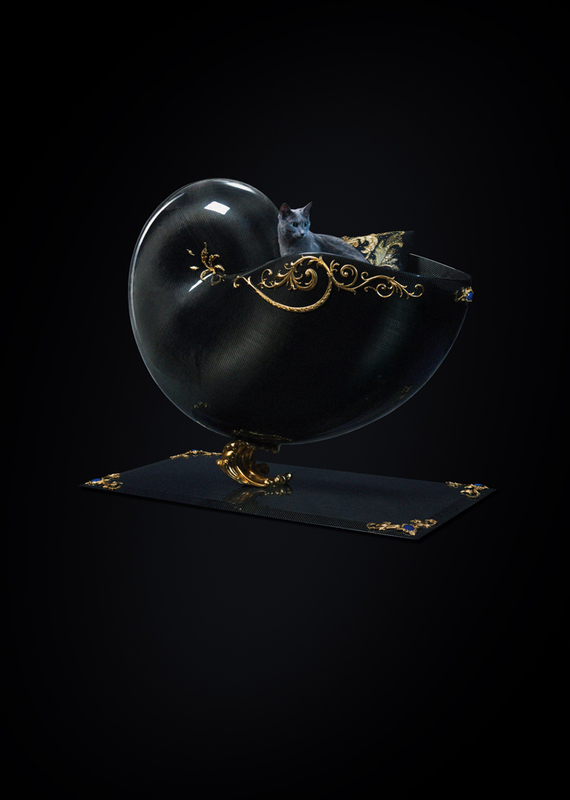 Work of primigenial art and synthesis of the absolute: the Nautilus incarnates a tribute to the bond of love between Human and Feline, the living emblem of supreme elegance and equilibrium, and stimulates the pulses of an emotional connection that is profound and exclusive. 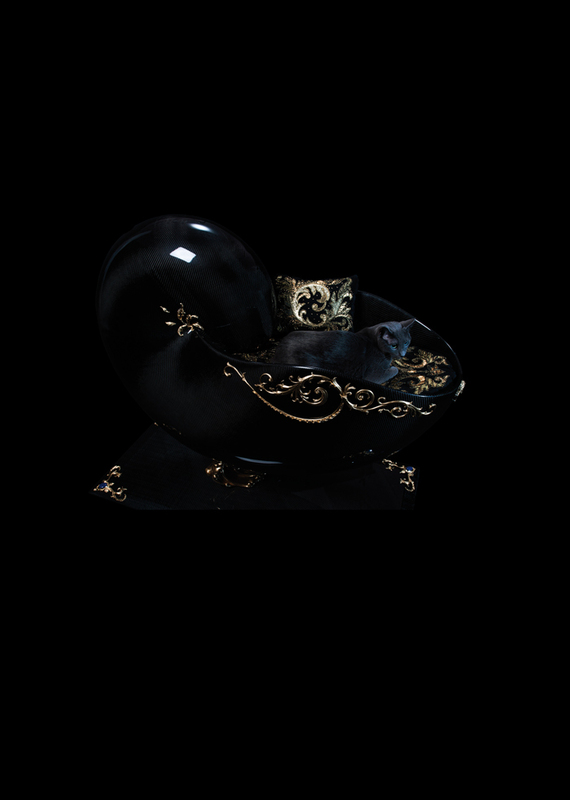 The magnetic gleam glowing in the feline eye; the lustrous reflections of a cat’s silken fur. 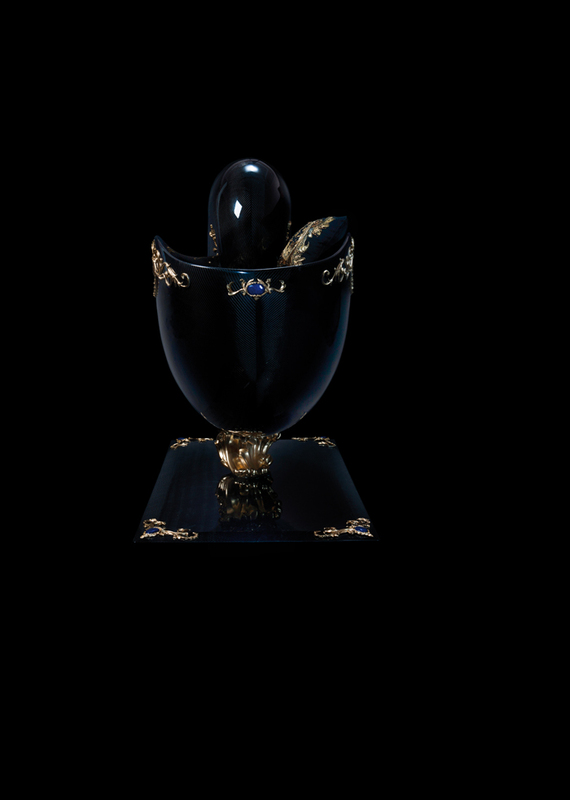 Luminous expressions of its vital force celebrated through the auric ornaments and illuminated by the radiant hues of the gems embedded in the shell. Circle after circle the winding spiral unfurls until it blooms into a great chalice that sustains and protects, in an unceasing dialogue with the surrounding environment. A kaleidoscope of refractions, reverberations, shades, captured colours and released hues. The work of art thus becomes a precious bed of elegance and comfort. Here, the cat is reminded once again of its divine origins. Here, at last, the supreme secret of the Nautilus is revealed: harmony of life, sublimated into eternity through the spell of love.